uuid : fe845349-fb51-40a9-b254-4065a123aa0f templates_id: 119493 templates_uuid: "f0175674-3497-4676-b59a-5c673f20b980" title: "Section 8 Notice - Section 8 Notice to Quit - Section 8 Notice Template" display_name: "Section 8 notice" meta_keywords: "Eviction notice and Notice to quit" description: "Make sure you follow proper procedure when you want to take possession of your property from a tenant that remains at the premises with this section 8 notice to quit. If your property is let on an assured shorthold tenancy, the most common form of tenancy with private landlords, you\'ll need to use this section 8 notice template to ensure that you have the grounds to obtain possession of the property. What is a section 8 notice ? A section 8 notice is a notice seeking possession of a rented property from a tenant on grounds set under section 8 of the Housing Act 1988. These grounds include rent arrears, irregular rent payments or damage to a property. Do I need section 8 notice? This notice should be used before you apply to the court for possession during a fixed term, i.e. the period for which the landlord and tenant agreed to contract for the tenancy). In what circumstances can a landlord serve a section 8 eviction notice on tenants? Ground 13 applies where the tenant damaged property including damage to any common areas to which the tenant has access in the building of their property. Also, a tenant will be deemed to have damaged the property where they allow someone living with them, eg a sub-tenant to cause damage. In this document, you can choose any of the above grounds for the purposes of serving a section 8 notice. If you have doubts as to which ground is most suitable to your circumstances Ask a lawyer. What measures must a landlord take before serving a section 8 eviction notice on Ground 8? A landlord must ensure that before serving a section 8 eviction notice on ground 8, the tenant is in arrears of the relevant amount of rent on the date the landlord gave the tenant notice and/or on the date of the possession hearing in court. How must this notice be served on the tenants? The notice must be sent or handed personally to the tenant. Where there are joint tenants, the notice must name all of the tenants who are on the agreement. A notice addressed to only one joint tenant would be invalid. Where there are joint landlords, the notice can be served by one landlord or all of them. When can the landlord begin court proceedings for possession? The landlord can start proceedings only after the notice was received by the tenant and the notice expires. This will depend on the ground(s) the landlord is using. The limit for landlord to start possession proceedings is within 12 months. If the tenant is still in arrears at this point the landlord may apply to the Court for an Order to possession. This can be done by filling the relevant forms with the court. Can an agent serve the notice on a landlord\302\222s behalf? The notice can be served by an agent on behalf of the landlord. In this document you can choose who will be serving the notice. This Section 8 notice is governed by the law of England and Wales. \r\n" created_timestamp: "2018-10-08 04:36:24.0" modified_timestamp: "2018-10-08 04:36:24.0" active: true created_by: 104 modified_by: 104 dcm_id: 283 url_slug: "Section-8-notice" meta_description: "Prepare a Section 8 notice to quit if you want to take possession of your property with help from Rocket Lawyer. 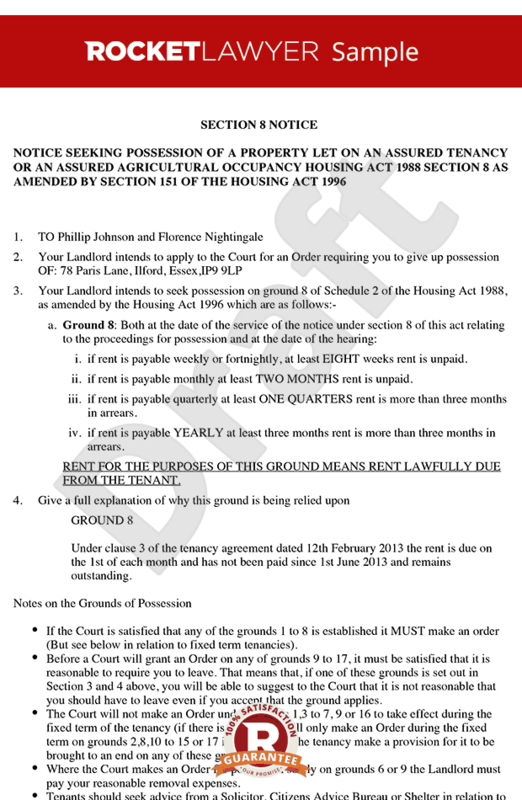 If the tenant on an assured shorthold tenancy hasn\'t paid the rent but remains at your property try this section 8 notice." time_to_complete: "10 minutes"
Make sure you follow proper procedure when you want to take possession of your property from a tenant that remains at the premises with this section 8 notice to quit. If your property is let on an assured shorthold tenancy, the most common form of tenancy with private landlords, you'll need to use this section 8 notice template to ensure that you have the grounds to obtain possession of the property. You need a section 8 notice if you want to get possession of your property during a fixed term tenancy or during the first six months of a tenancy. Use this notice if the tenant has not paid rent or they have damaged the property without repairing it. Ask a lawyer if you wish to gain possession for any other reason. Can an agent serve the notice on a landlords behalf? More than just a Section 8 notice template, our step-by-step interview and guidance makes it easy to create your document. Easily create online, download, print and sign your free Section 8 notice in minutes. This document is also sometimes called: Eviction notice and Notice to quit.